The living room is the most public place in a house. It is a place where we receive and entertain guests, so it is only logical that it should be the most dazzling room in the house. A couple wanted to refurbish their living room on the occasion of the marriage ceremony of their only daughter. Their main request was for a longer living room. As they were the owners of the duplex house, this was easy to fulifil. The first consideration was of course space. The living room should be airy enough to be both comfortably cool and cosy at the same time. The living room was situated on the first floor. A wall was knocked down to create a larger seating area. The floor was initially covered with a very shabby mosaic. Initially, the designer wanted to replace this with tiles. The budget was a concern, however, and the clients did not want to spend too much on floors alone. So the designer fitted a brown synthetic carpet on the floor. This made the floor look brighter and cleaner. 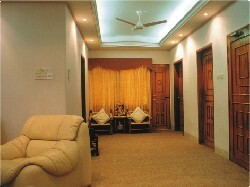 A long 1' 8" false ceiling was fitted in, to which the designer added attractive stepped beats for decoration. The living room should be an island of soft illumination that invites people to relax and converse. With this in mind, indirect defused tubelights were installed inside the false ceiling. Spotlights were also installed, for special effect. Layered lighting creates an atmosphere that is humanising and dramatic at the same time. The curved super teak false ceiling served the dual purpose of decoration, as well as hiding all the wiring, making the walls look more attractive. The designer attached a decorative wooden partition near the entrance of the living room, for security. This acts as a landing space for the inside stairs. Curved palemates of deep orange were arranged on top of the windows. Brown silk curtains and matching shears were also used, in accordance with the colour scheme of the entire room. 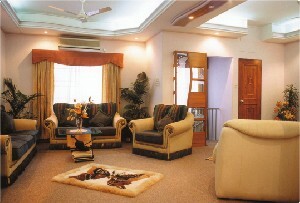 Two foreign sets of heavy sofa were placed, to which the designer added a centre table. Small rugs were placed to give that plush effect. The doors were completely transformed by the use of simple beats and good polish. The spaciousness of the corridor also makes the living room more comfortable. Finally, flower arrangements were set atop the centre table, and green plants and stone arrangements were added to create a fresh, healthy, and homely atmosphere.